He was born Philip Schwartzerd, a German name meaning “black earth.” But like many young scholars of the time, he showed his commitment to ancient learning by translating his name into Greek: melan = black, chthon = earth. Melanchthon intended to live the humanist scholarly dream, and had grand visions of fulfilling the Renaissance’s mission by publishing a critical text of Aristotle’s works. He took a teaching position on the faculty of arts at Wittenberg, from which he hoped to undertake this great philological task. But at Wittenberg he came under the influence of the mighty reformer Martin Luther, 14 years his senior. Melanchthon began teaching the Bible more than the classics, and was soon on the faculty of theology. He was a devoted follower of Luther’s teachings, and Luther respected Melanchthon’s scholarly powers as vastly superior to his own. Throughout the turbulence of the Reformation, Luther and Melanchthon were an inseparable team, maintaining a unified front against all opponents. 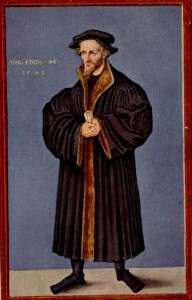 Melanchthon took charge of the Reformation in Wittenberg while Luther was in exile, and later after his death. It was Melanchthon who wrote the Augsburg Confession, Lutheranism’s first and authoritative creed. That reverence, faith, trust, invocation, and gratitude may be awakened and strengthened through God’s word and knowledge, all Christians should spend some time each day inwardly contemplating the gracious divine revelation and teaching in the writings of the prophets and apostles and in the creed, for these are, and forever will remain, the source, the wellspring, and ground of our faith. Many books have been written, however, in which an alien meaning has been given to the divine word and the words of the prophets and apostles, and this has occasioned all sorts of quarrels. Rightly oriented teachers are needed, therefore, to clarify and preserve the proper meaning of the words of the prophets and apostles. And such true teachers do not invent new or peculiar doctrines about God; instead, they stay close to the unadulterated meaning, which God himself has revealed through the words which are found in the writings of the prophets and apostles and in the creeds. The entire office of preaching, which God has ordained for public assemblies, is to present to the people these and no other writings, except the writings of the prophets and apostles, and the creeds, and thus unfold, as in a grammar, the true meaning of the words, what God is called, what created things are, and what such terms as body, spirit, person, law, sin, gospel, promise, faith, grace, justification, and worship mean. To learn the true meaning of the terms and writings is to recognize sublime wisdom and divine light. Whoever wishes profitably to teach himself or intelligently to instruct others must first comprehend from beginning to end the principal pieces in a thing, and carefully note how each piece follows the one preceding — just as a builder, when he wishes to build a house, must first construct the entire building in his thoughts and himself project a picture. For if one is careless about doctrine and omits a few necessary pieces, delusion and error follow in other parts; and if one does not keep the end in view, it is the same as if one undertook a journey and gave no thought to the city to which one desired to go. The order in which the pieces fit is what one should know if one would teach others. However, the heathen know absolutely nothing about the gospel and grace, for this comes through a special divine counsel, above and beyond the natural reason of all angels and men. Out of his unmeasurable mercy God himself revealed that he would redeem wretched man through his Son, Jesus Christ, again receive him in grace, and bless him. In earnest invocation of God it is necessary to consider what one wants to address, what God is, how he is known, where and how he has revealed himself, and both if and why he hears our pleas and cries. And our thoughts must not waver as the thoughts of the heathen who know a great deal – that God is an omnipotent, wise, and just Lord who created everything – but not where he may be found, nor if he will hear our cries. They cry to God only out of custom; they know nothing of his revelations, the Redeemer, and the promises. Concerning this blind invocation, Christ the Lord says, in the fourth chapter [v.22] of John: “You worship what you do not know.” For this reason Christians are to shun the invocation of the heathen and Turks, and are to instruct themselves so that they may not fall into the error of addressing as God things which are not God. We should carefully avoid [false doctrines] and other lies and thoroughly learn the right doctrine and receive it with firm faith, in order that invocation of God may remain true and firm. O omnipotent, wise, pure, just, and merciful God, eternal and only Father of our Savior, Jesus Christ, out of thy great goodness thou hast revealed thyself, and hast said that we should listen to thy Son, Jesus Christ: Thou who hast with thy only begotten Son, Jesus Christ, and thy Holy Spririt, created heaven and earth, angels and men and all creatures: Thou who hast said, “As I live, I have no pleasure in the death of the wicked but that the wicked turn from his way and live” [Ezek. 33:11]! – I heartily beseech thee, have mercy on me and forgive me all my sins. Be always gracious unto me and make me righteous through thy Son Jesus Christ, whom thou in thy unutterable goodness and wisdom didst ordain to be a Mediator and Redeemer. Enlighten my soul and heart, make me holy, and guide me with thy Holy Spirit. Uphold thy true Church and good government for thy people. And may we in true thankfulness eternally praise thy great mercy. Amen. –From the Loci Communes of 1555. Culled from Preface, Dedication, and Loci I & II.